Who were the Ancient Egyptian Tomb Robbers? The Ancient Egyptians believed that life and death were stages of progress to a better life in the next world, the Afterlife. The Afterlife was perceived as a perfect existence in an ideal version of Egypt. Ancient Egyptians provided for their afterlives according to their earthly means and their finest possessions including furniture, clothes, jewelry, gold, silver, weapons, precious oils and cosmetics were buried with them in their tombs. Treasures beyond wildest beliefs - was it any wonder that burial sites of the Pharaohs, royalty and the nobility attracted the attentions of tomb robbers. The first tomb robberies were documented in the reign of Ramses IX (1124 BC – 1106 BC), a pharaoh of the Twentieth Egyptian Dynasty in the period of the New Kingdom. The nomarch, or mayor, of Eastern Thebes called Paser compiled a report on a spate of tomb robberies in the Valley of the Kings. In the report he accused the nomarch, or mayor, of Western Thebes called Paweraa of either being involved in the Tomb robberies or being negligent in his duties in protecting the tombs. The charge was never proved. 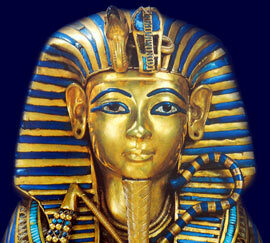 The vast riches buried with their owners are often assumed to be subject of poor Egyptians of the lowest classes. Although this is true there were other types of tomb robbers. The most surprising tomb robbers were those acting for the ruling pharaoh. There are numerous examples of Pharaohs removing grave goods and using them for their own burials. Pharaohs even used the tombs of previous pharaohs. It would seem that once a grave, or tomb had been defiled, or robbed, that it was permissible to remove objects for subsequent use in their own burials. Once a tomb had been desecrated it was believed that any further disturbance would not anger the gods. Only the original tomb robber was punishable. Other robbers included men who worked on the tombs and that officials received a 'rake-off' from the booty. Obvious robbers were also men who guarded the tombs and even the embalmers were known as tomb robbers, as were Ancient Egyptian priests and scribes. The were grave warnings which were carved into tomb hieroglyphics relating to the punishments in the afterlife which would be enacted by the gods and the occupants of the tombs on tomb robbers. Curses such as the curse of Osiris "Death comes on wings to he who enters the tomb of a pharaoh" did not deter the tomb robbers. Tombs were bolted and sealed. Tombs contained secret chambers, burial chambers containing treasures were difficult to access and hidden from sight. Entrance passages or shafts leading to the tombs were blocked with huge stone slabs and mounds of rubble. There were blind passages and trap doors. Hidden holes and wells. There were even wires designed to decapitate the tomb robbers. It was also believed that the Ancient Egyptians used poison in the coatings of tombs or in powders which were released into the air when stones were disturbed. And finally, tombs were guarded by necropolis guards. These security measures were all overcome by the the ancient tomb robbers. Robbing a tomb was not an easy task, it required a team of people to commit the crime. The gangs numbered up to ten people. The jobs of the robbers who infiltrated the tombs included laborers, stone masons and water carriers and lamp carriers. Once treasures were removed from the burial site they were hidden in the robbers cache or precious metals were melted down or sold to unscrupulous traders in antiquities. The punishments for those convicted as tomb robbers were extremely severe. Robbery, damaging tombs and the fencing of stolen tomb goods were criminal offences. Confessions was the base for a conviction together with circumstantial evidence and witness statements. Torture was used to achieve confessions. The initial methods of torture were whipping and beating. The arms, legs and back were beaten or whipped mercilessly to obtain a confession. Threats were made to cut off hands, ears and the nose. And in severe cases these threats were carried out as punishments. Death sentences were rare in Egypt compared with other ancient societies but robbers were executed. Executions took the form of impalement or been burnt alive. Both of these methods of execution had implications for the eternal life of the tomb robbers. To be burnt to ashes would mean that there was no body to pass into the afterlife and the sentence of impalement meant that the Ka would be forever tied to the place of execution. Each section of the Tomb Robbers addresses all topics and provides interesting facts and information about the Golden Age of Pharaohs and of Egypt. The Sitemap provides full details of all of the information and facts provided about the fascinating subject of the Pharaoh - Tutankhamun and the Tomb Robbers!